Eczema is a common skin condition seen in general practice particularly among infants. It is also known as atopic dermatitis. It consists of skin that is inflammed with the presence of swelling, itchiness, red papules (small raised rashes) and oozing. It is a chronic (long term) condition that causes itchiness. Eczema is most frequently found on the face, wrists and inner surfaces of the elbows and knees. The affected skin may become thickened. Usually children get eczema before the age of 5 years. Most children will grow up without this problem if they do not have allergies or asthma. It is not an infection. It is a hereditary condition. It is not an allergy itself, but allergies can be trigger eczema. It can develop on skin that is dry, itchy and sensitive to things like heat, wool and rough surfaces. Irritants such as soaps, detergents, or perfumes. Food allergy or allergy to any substances can aggravate eczema. What are the symptoms & signs of eczema? Patches of chronically itchy, dry, thickened skin usually on the hands, neck, face and legs. Redness, scaling and changes in skin colour. Small bumps or blisters which ooze fluid. 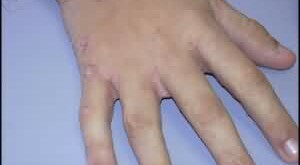 How can eczema be treated medically? Moisturizing lotion, cream or ointment to control the dryness and itchiness. Steroid creams for severe cases. Antibiotic if secondary bacterial infection is present. The above treatment only helps to control the symptoms not to cure it. Eczema can disappear and reappear if expose to allergens. How else can I help my child? Keep your child in a cool room. Avoid hot bath and overdressing. Use soft cloth preferably cotton. Avoid contact with scratchy fabric. Do not use soap during bathing. Put a moisturizer after drying the child. Look for suspicious food allergy and confirm with the doctor.